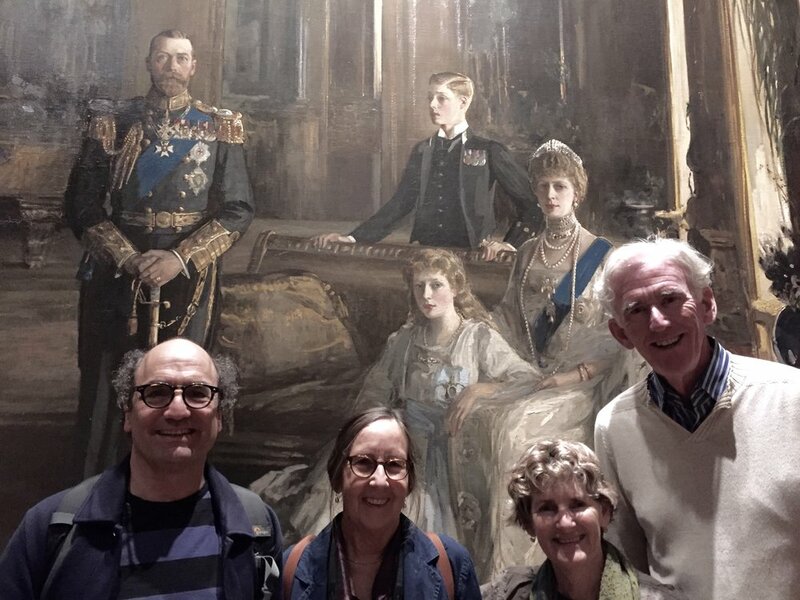 On our third and last day in London, fueled with a morning croissant, we set off for the National Portrait Museum where our friends Bill and Mary Lea had hired a guide for the day and generously invited us to join them. Sarah, the guide, had come up from Hastings (on the Sussex coast). We started at the beginning: a portrait of the despised Richard 3rd , followed by various portraits of Henry VIII with his great girth, shapely legs and pronounced codpiece. Sarah was especially erudite about what each detail, from crown to leg and foot position symbolized. Michelle was delighted to see a fine portrait of the genius garden designer and writer, Gertrude Jekyll, who started as a painter and an embroiderer, then moved to garden design. I could not find Anthony Trollope but we did see his mother, Frances, who supported her husband and seven children with her writing. Her first book was Domestic Manners of the Americans, (a great title, no?) and she wrote the first anti-slavery novel (Jonathan Jefferson Whitlaw) which is said to have inspired Harriet Beecher Stowe. Herdwick mutton shawarma—which was actually more like shredded lamb, deeply beautifully spiced and served with little knuckly bits of kohlrabi, and pickled watermelon, with yogurt and some fragile tortilla-like flatbread. Big shiny bright red roasted Romano peppers were topped with bright green zhoug, (push that word for Ottolenghi’s recipe) beige tahini, bright white manouri cheese (a creamier feta-like cheese that is actually a byproduct of feta making) and toasted pine nuts. We started wending our way back to “South Ken” and finding ourselves in Mayfair, we went in search of the Heywood Hill Bookstore at 10 Curzon Street, where Nancy Mitford once worked.It’s still there! When the bookstore’s owner, Heywood Hill, went off to war, Nancy Mitford minded the store from 1942 to 1945--for a miserable £3 a week. She attracted all the literary lights of London (Evelyn Waugh was her great friend at the time) and also, “half the Free French Army.” A tight squeeze in the tiny place. When Hill returned, Mitford, who was enjoying the success of her fourth, and first best-selling novel, The Pursuit of Love, moved to Paris. These days, the shop is owned by her nephew, Peregrine Cavendish, the 12th Duke of Devonshire. A blue plaque commemorates Mitford’s stint at the store. It is a wonderful, cozy little bookstore, with a careful selection of books nicely displayed, new ones in the front, and used and rare books in the back room. When we were there, there were large bulging sacks of books sitting 2 thick against the lower shelves—the store operates a book-subscription service (there are several plans, 6 or 12 paperbacks, 6 or 12 hardbacks, or up to 40 books a year—you subscribe, describe your preferences, and books are chosen to suit your individual taste). This subscription service no doubt helps keep the shop alive, but as the young salesclerk attests, it’s a lot of work. Impressive. Michelle bought a book not yet available in the U.S. which she likes to think is by a literary relative of Mitford’s, in that it’s a smart, often funny novel of manners: Normal People by Sally Rooney. Back at the hotel, we reclaimed our bags and took a cab up to the Crick Institute where our friend Jean Paul Vincent works as a cell and developmental biologist. Jim has been friends with JP and his wife Veronique Mistiaen, since graduate school at Berkeley in 1980. JP took us on a tour of the building, which looks like a futuristic Hogwarts, all glass with glass staircases and glass bridges criss-crossing the many floors over an open atrium. JP’s desk and lab were on the third floor toward the southwest, (dubbed SW3, mirroring the London city zones). His floor was divided into dry and wet areas—the wet areas being where experiments were performed. We saw microscopes that can see through layers and produce “optical slices” of the fruit flies studied. JP’s post doc, Sophie, showed us a short time lapse film of cells developing in the wing of a fly: they began as a churning stew of undifferentiated cells and, as if coming into focus, organized themselves into veins and wing blade. How did the cells know where to go? That is the question. One question. Then we went across the way to the fly room where another kindly post doc put some girl and boy fruit flies under the microscope for us to see. The girls were plumper. These flies had slightly curly wings because of a mutation. We saw, too, the fly stock room—a kind of fly library—which contained every strain generated or obtained by the lab over the years. These flies are kept at a cool temperature to prevent them from developing too fast. They’re “flipped” every four weeks—meaning that you transfer flies to a fresh vial with fresh food, let them lay eggs so that the next generation can be seeded for the next four weeks. The old ones die of old age…If you saw how many vials of flies were in this room, you would be impressed by the task of monthly flipping. It was Friday afternoon and on virtually every floor of the Crick, a party was in progress—which makes it seem a friendly, fun place to work. JP, Jim, and I crossed the street to the St. Pancras station and caught the train to St. Albans where Veronique picked us up and took us to their home. We ate a delicious fish tagine with couscous, joined by their daughter Zoe, a PhD student in Cancer Biology, and laughed about old times and memories late into the night. Another long day, full of curiosities and friendships.